Tooele’s Aaron Kurek attempts to pin Stansbury’s Chance Shields Tuesday. 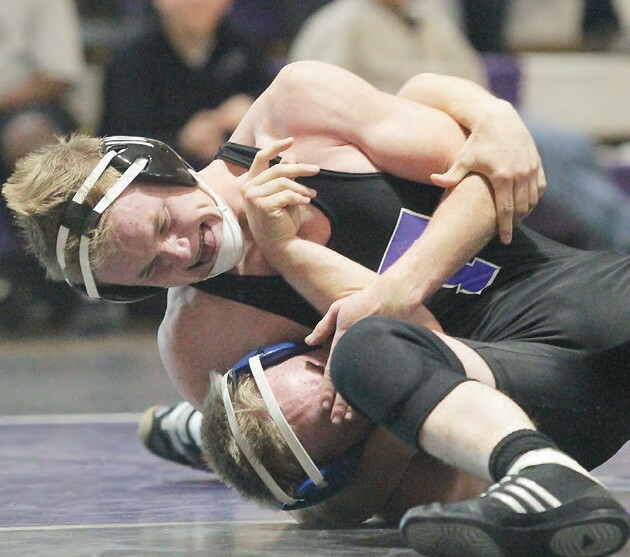 Tooele won its duel against Stansbury thanks to six pins. Stansbury grabbed a slim 10-9 lead in team scores when Chance Shields pinned Tooele’s Aaron Kurek with 10.6 seconds left in the match at 160 pounds. The Buffaloes then rolled through the next five matches with five pins to collect 30 unanswered points to go up 39-10. Tooele went on to win a 10-of-14 matches to pin a 48-22 victory over the Stallions Tuesday night at the THS gym. The Buffaloes ended up with six pins for the night while the Stallions came through with two pins. 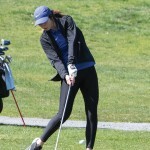 “I thought we wrestled really well, especially in the upper weights. 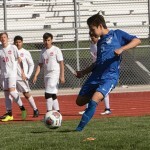 And the matches we did lose were close with kids with a little less experience,” said Tooele coach Gary Coffman. Shields and Kurek wrestled a classic match and the two grapplers were tied at 13-13 with 1 minute left in the match. Shields gained a takedown with 27 seconds and appeared to have edged out Kurek with a decision. But Shields kept the pressure on and pinned Kurek with 10.6 seconds left in the match. Stansbury grabbed a second pin late in a match at 132 pounds when Marcello Mascarenas pinned KC Hansen with 40 seconds left in their match. After Shields gave the Stallions a brief lead, Stansbury ran into two the Tooele’s top wrestlers in Seth Manning at 170 and Zach Coffman at 182. Manning pinned Brian Perez in the first period and Coffman pinned Easton Brown in the second period to give Tooele a 21-10 lead. Tooele’s bigger guys continued to pin their opponents. Johnny Sullivan pinned Nathan Hintze at 195, Daniel Aragon pinned Marty Johnson at 220 and Thomas Jensen pinned Ronnie Hill to give the Buffaloes at 39-10 lead. Tooele’s Jacob Leo and Stansbury’s Gavin Skogg put on a good show in the 106-pound match. Skog led 7-5 after the first period with a take down and reversal. Leo came back with a near fall and takedown in the second period to tie the match at 9-9. Neither wrestler could score in the third quarter to send the match into overtime. Skogg got a takedown to start the OT and win the match 11-9. The varsity match started with the 138-pound wrestlers and Tooele jumped out to a 6-0 lead when Garrett Gleed pinned Heber Valles in the first period. At 145, Tooele’s Cole Fonger defeated Tayven Dilleshaw 7-0 to push Tooele’s early team lead to 9-0. The Stallions battled back with Tyler Bates controlling the match against JD Furuta at 152 and winning by a 10-2 decision to score Stansbury’s first points to make it 9-3 for THS. Shield’s last-second pin pushed his team ahead 10-9. Tooele then got five consecutive pins with the bigger guys, and the Stallions gained two decisions to make it 39-16. Tooele’s Nick Porter scored an 8-1 victory over Nash Brown at 120 to make it 42-16, and Tyson Vigil wrapped up Tooele’s scoring with a pin over Logan Bowles in the third quarter to push the point total to 48 for the Buffaloes. Stansbury’s Mascarenas pushed his team’s point total to 22 with his pin in the final match of the night. 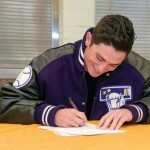 Tooele was without 113-pound star Jarrid Lavios who couldn’t make weight. The Stallions held out one of their top wrestlers, Logan Stewart, at 126. Stansbury will host the Stallion Stampede Friday and Saturday with matches starting at 3 p.m. on Friday and 9 a.m. on Saturday. Tooele will be at the Weber Duals on Friday and Saturday.